Many small business owners closely keep an eye on their expenses and earnings, because they have limited capitalization and resources. They try to look for ways to make their business known without spending too much as well as making each dollar count. The reality is that even a small business has to cater to a multi-ethnic consumer base. It does not matter where the business is located as most areas have a diverse community. Therefore, in the business environment, the size of the company does not matter because the consumers who patronize their shops speak different languages. As soon as an owner accepts that his business is catering to multi-lingual consumers, he’ll be able to realize that there is great value in having materials and consumer information, particularly his business website translated into a few major languages. Translation, for a small business, is a big expense and some owners may even think that it is a waste of precious budget. But selling your products and services in different languages offers several advantages to a small business. Translation helps grow the business. If information is available in different languages, it encourages customers who are not English speakers to patronize the shop and buy its products. This means that even small businesses can compete with other businesses that are bigger in size and resources. It only highlights the importance of translation. Most businesses today, even if they are not ready to compete in the global market have chances of reaching multilingual customers. The Internet is a big factor in this, as it allows more people in different countries to access information from anywhere else in the world. Therefore, a business might not be thinking of going global yet but if it carries products sought by international consumers it may receive inquiries if they ship products internationally. Exporters, even if they are still small but have good products to sell can reach potential buyers faster if they have their websites and product information in different languages. They may have target countries in mind, which mean they need to translate their product information, product descriptions, company profile, their terms and policies and all business and product documents translated into the target language/s. Translation facilitates faster and better communication between exporters and importers. If there is a need for face-to-face meeting, an interpreter might be required as well. Translation should be a part of a company’s export strategy today. It does not matter what size the exporting company is. What matters is to get the company started in the right direction and that means using translation to bridge the language difference at once. English may still be the language of business, but in the larger business stage, it is important to think of the future. Developing markets are worth exploring. It might be difficult to enter the mainstream business communities but if the owner is resourceful, he’ll be able to find other markets that are looking for specific products to import. Such markets are easier to penetrate and develop. Once you have gained success in the smaller markets and your business has grown, you’ll find it easier to enter the bigger markets because you have already prepared. You already know the process of having your materials and business and product information translated into target languages and what things foreign markets require. In the business scenario today, it is critical to think of bridging the language gap, not only by translating websites and other business and product information, but also in hiring multilingual staff. In the UK for example, many people are still not able to speak a foreign language because they think that using English is enough. In effect, they are isolating themselves because of their inability to speak or understand a foreign language. This has a great impact in their international trade relations. While many countries speak English, business owners and consumers still prefer to conduct business in their own language. They put their trust more in companies that take the time and effort to have their information available in the languages their foreign consumers speak. When selling products or negotiating business deals, it is international business etiquette to use the language of your foreign business counterparts unless they prefer to use English. Many reports and analyses have been published about how the UK loses billions in their annual export earnings because many of their companies are not able to speak or deal in other languages. The importance of translation should therefore not be undermined. Translation does not only to prepare you for international markets. In the United States alone, the business competition is fierce. The number of immigrants who cannot speak English is still high. Many ethnic communities also prefer to find stores and other businesses where they are able to converse in their own language. According to Statista, the highest ethnic community in the U.S. is White, Non-Hispanic followed by Hispanic community. Other ethnic communities include African-American, Asian, people of two or more races, American Indians and Alaskan Native and Native Hawaiian and other Pacific Islanders. Small business owners must realize that not all of them speak English well enough to communicate and while some know a bit of English, they still prefer to talk in their own language to keep their connection to their home country alive. Translation can help you to compete better in the domestic market, develop a new customer base and improve customer loyalty and patronage. As mentioned previously, once you have a website, it is impossible to avoid access to it from foreign buyers. Even if your current clients are in your home country, other cultures will be able to access your website. Translation can help them understand your information about your company, your products and services. Once your products gain wider acceptance, your revenue will exponentially increase. If you are conducting an online business, the more you need the help of translation or specifically, localization, to make your product information available in other languages aside from English. If your competition is not yet localizing, you’ll gain a competitive edge over them. Localization is a more involved way of translating information. This means that your website and all the other related information are translated into other languages. This also means adapting your website into the culture of the target countries, from colors to images, to date/time/currency/address formats and more. Customer support is important for domestic and international business. It can be a major expense if your business is still small. Localizing your website helps improve your customer support because all the information are available in the language your foreign consumers speak. Their user experience in using your website is enhanced because they understand what they see and read. Most foreign consumers who purchase online prefer to shop from companies that speak their own language. It is one of the major reasons why small businesses need translation services. When your website is localized, you adapt your website to the look and feel of a local company. Foreign consumers feel at home when they are able to purchase from an online shop that is available in the language they fully understand. You do not have to spend too much on advertising and marketing because your localized website would do most of the work for you. You’ll be able to penetrate your target markets effectively because you talk to them in their own language. You minimize your expense and lessen the time it takes to penetrate your target markets. With professional translation and localization services, miscommunication is minimized or eliminated. Your website is in a local language and your translation partners and your website designers will be following the target country’s regulations. Your liability is reduced because all the product information, marketing materials, product use agreements, end-user agreements and contracts are translated in the target language. Information that is written in a foreign language makes the citizens legally bound to follow them, thus the risk of copyright infringement becomes lower. What should a small business owner do? You need to present a good business image domestically and internationally and one of the ways to do that is through translation. In order for translation to be a part of the marketing strategy of a small business, the owner must reverse his thinking. He should not think that translation is an added expense but rather as an investment for the growth of the company. If you think of translation as an additional cost, you will not be able to compete against other businesses that recognize the role played by languages in attracting and developing new customers. Owners should also accept that not all consumers in the United States speak English. The next step is to find the right translation company to localize your website and all your written information. Aside from their credentials, you should look at the languages they work with. 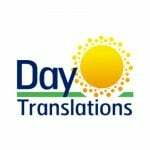 You should find a translation company that you would be comfortable working with and one that is willing to be your partner in growing your small business. Day Translations, Inc. is always ready to serve businesses, large and small. We work with more than 100 languages and we only use human translators who are native speakers. Our translators are located in various parts of the globe, waiting to serve you anytime you need translation services. We are open 24/7, 365 days of the year, so you can get in touch with us anytime through email at contact@daytranslations.com or by calling 1-800-969-6853. For mobile and tablet users, you can download and install Terpy to easily connect with us. It is freely available from iTunes and Google Play.